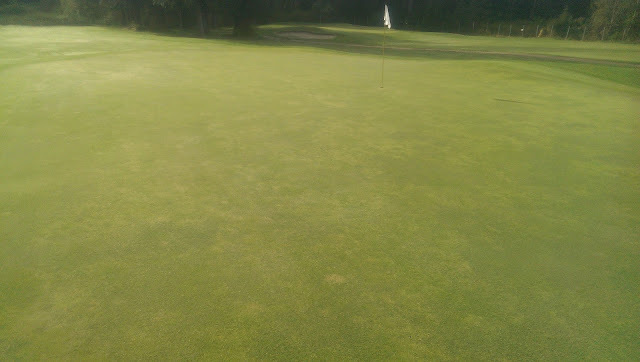 I've been measuring clipping yield on my greens for the past 5 years. The reasoning for this is to get a good idea of how fast our grass is growing. After all, this is one of the most important things to know as a greenkeeper as described in Micah Wood's book "A Short Grammar of Greenkeeping" which I highly recommend you buy. In it he defines greenkeeping as "managing the growth rate of the grass to create the desired playing surface for golf. All of the work done to the turf is centered around managing how fast the grass will grow. This is consistent across all parts of China. And the best golf course conditions will be created when the superintendent is able to create just the right growth rate." How fast is your grass growing? The more I learn about our profession the more I agree with this statement. 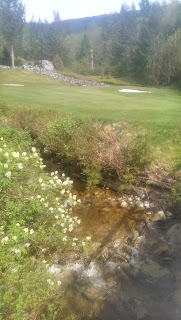 When I was a young superintendent the growth rates of my turf were all over the place. We were hit with huge growth flushes without notice and were left chasing our tails trying to get everything mowed in time. We had huge issues with grass clippings, thatch, and other turfgrass growth related issues (hint; it's all related to growth). In the past few years as I have learned to manage the growth rates of my grass better by using the growth potential formula to schedule fertilizer rates we have had far less surprises when it comes to growth rates of our grass. We have also had less surprises when it comes to disease, green speed issues, water management and pretty much every other aspect of our golf course management operation. 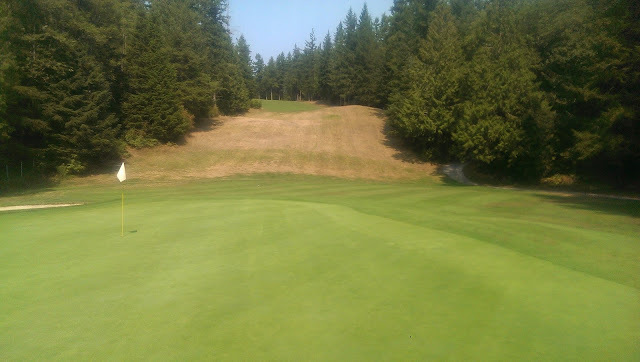 This week while looking over my growth rate records I noticed that this year we have been able to keep our growth rates low and more importantly consistent despite the weather being abnormally warm for this time of year. 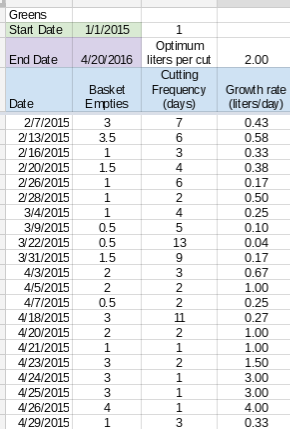 As you can see below, we were cutting a frequency of every 3 or 4 days starting right at the beginning of February. 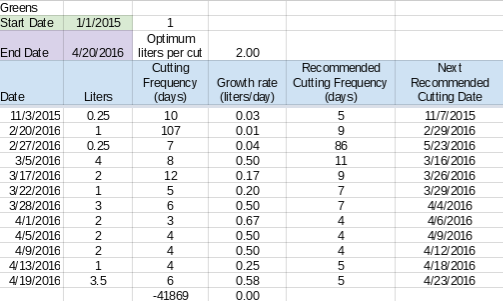 This time (mid April) last year we were cutting daily to keep up with the growth rate explosion. This year, despite the extremely wet and warm conditions, we have been able to only cut every 4 days starting in late March. This was following a period of 107 days where we didn't mow the greens at all. When we finally did mow the greens on Feb 27 we got almost no grass! The growth rate has also been very consistent this winter. We are now in mid April just before the time when we historically get a big growth flush. I'm not sure whether or not we will get it this year though because we have had weather similar to mid July for the past few weeks and still, growth remains minimal. So what am I doing different this year than in previous years? Diligent growth regulator use through the winter. I did not allow the turf to come out of regulation at all this winter. 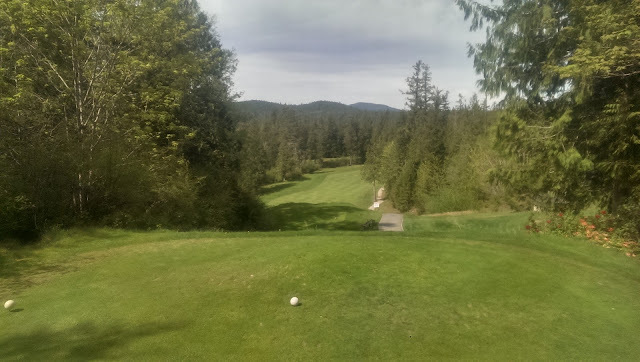 We also did not let off the applications for our "aeration" which consisted of only a medium topdressing as we had aerator issues and I was already questioning the need to aerate in the spring with the low growth rates we have been having. We aren't pushing growth. In previous years we have had issues with disease on our course but for some reason I'm not 100% sure why we have had almost no disease pressure this year. In 2016 we have only applied 0.96 g of nitrogen per square meter (0.2#N/1000sq ft) until the end of April. In 2015 we applied double that. It wasn't until last May that I decided to see what would happen if I cut the amount of N I applied to my greens in half. So far I consider this decision a success but time will tell. The greens don't look like they normally do but they play great and have only required 3 fungicide applications since the beginning of October! I am watching the greens closely for signs of wear but so far we haven't had any issues even though we have been rolling daily (or twice daily) for the past month. Those of you who have an extra keen sense of observation might notice that in the past we used "basket empties" to measure the amount of clippings collected where this year we use liters. 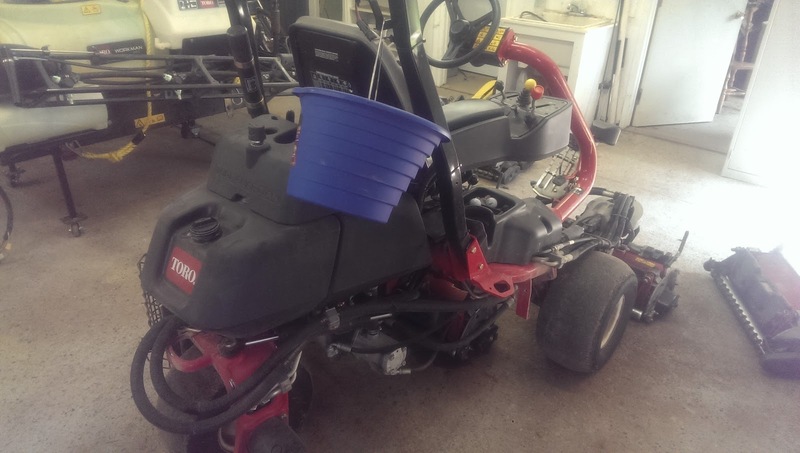 This was at the recommendation from Micah Woods because liters is a more accurate way to measure clippings that relies less on someone's perception on what constitutes a full basket of clippings. Objective vs subjective. Measuring clippings doesn't have to be a big chore but and there are a few things you can do to make it easy and the most useful to your operation. We only collect clippings from the middle mower on our triplex on 2 of our 12 greens. This is because it doesn't really matter what the total amount of grass collected is, we just want to have something to compare day to day. One of our greens is too small to gather enough grass for a good measurement so we use 2 greens. We only collect from the middle mower because we sometimes do a circle cut which would augment the clipping yields on those days. By using the middle basket we reduce the impact of this slightly. We just hang the measuring pail on the mower. Operators make sure the baskets are empty before we cut our 4th and 7th greens (they are close together) then empty the contents of the middle basket into our measuring pail when they are done mowing those 2 greens. After they finish mowing they put this number into the equipment use form and this is automatically fed to my growth rate spreadsheet as seen in the above images. Measuring the growth rate of my grass has been one of the most enlightening things I have done over the years. We often overlook the importance of collecting good data about what is actually happening on the course. We can get a good idea by just looking at the grass but without measuring and recording this data we make it difficult to learn anything from it in the future. As Micah outlined the importance of controlling growth rates I could talk forever about the benefits of this. Less wear and tear on machinery, less traffic stress from mowing, less thatch, less grinding reels, less labor, less fuel burned...the list is almost endless.